Manage syslog and SNMP trap data from your infrastructure to gain deeper insight and troubleshoot. Refine your log data via intuitive out-of-the box filters, and find relevant log entries instantly. Your enterprise infrastructure is constantly generating syslog, SNMP traps, and other log data that can help provide performance insights when troubleshooting such a large network. Being able to quickly and easily view these crucial bits of information helps simplify and speed up troubleshooting. SolarWinds® Log Manager for Orion® is built to be an all-in-one enterprise log management tool to help keep your network and business up and running. Log Manager is designed to continuously monitor log data, so you can identify potential issues as they occur. Quickly pinpoint issues by filtering for particular keywords like event IDs or error codes. Collecting, consolidating, and analyzing all your information within one log monitoring tool can help you find the root cause faster. Managing a large network comes with lots of log entries, and trying to manually pinpoint just one error or issue among thousands of log files can be such a chore. Enterprise log management tools are the most beneficial when they can effectively search this data, so you spend more time solving the issue rather than finding it. Log Manager for Orion enterprise log management system is designed for you to not only search but also filter your aggregated log data, allowing you to refine log data even further via intuitive, out-of-the-box filters. 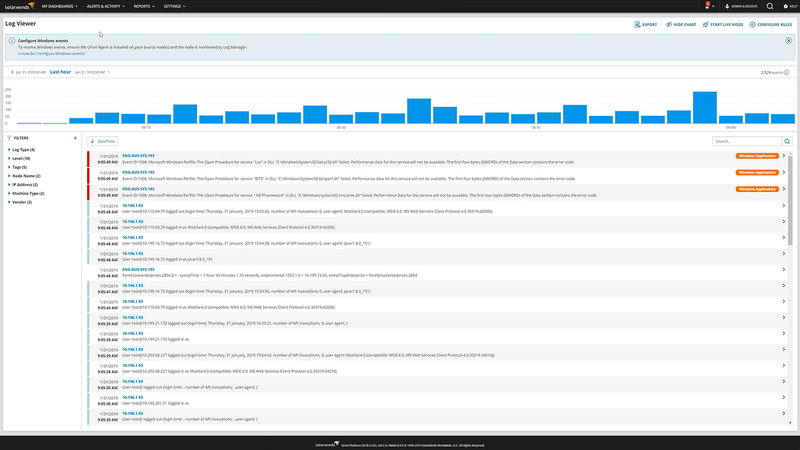 Using a powerful search engine that comes built in to Log Manager, you can quickly find log entries of interest and save time. Log Manager’s enterprise log solutions give you the ability to quickly visualize log volume, search results, and refine timeframes via an interactive chart. You can also visualize your log data in an interactive, real-time log stream. Since Log Manager is integrated into the Orion Platform of products, you can seamlessly include your log file data into the Orion Platform console to view it alongside your other enterprise network and systems performance metrics. Unifying your log data and infrastructure performance can help give you a clearer view of your overall network performance. Not managing your logs can hinder network visibility and troubleshooting capacity, leading to a slow network. Not managing your logs can prevent you from adequately identifying root cause, resulting in a longer mean-time-to-resolution. Navigating multiple tools for enterprise log management and performance data can result in lost insight.